At some point, every business owner will end up relinquishing the reins of the company they built. How this occurs is up to them: they can either plan how this process will play out, or they can let blind circumstance sort out the details. Actively planning an exit strategy can help entrepreneurs leave their company with the financial freedom they’ll need to stride confidently into the next phase of their life. 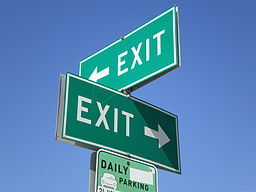 Most don’t bother, though, as a number of mental roadblocks have convinced them that exit planning is unnecessary. Below, we’ll go over the most common misconceptions which prevent owners from planning how they’ll exit their company. This assumption is a deceptively simple one: build a business until it makes sense to sell it; once they post their sales ad, buyers will magically flock to them, checkbooks in hand. The truth is, the majority of successful sales take place within a finite window of time. Buyers are far more likely to make a move when the economy is vibrant versus bad or uncertain times. Even when the economy appears to be doing well, not all aspects might be. Without a well-defined exit plan, factors ranging from the state of the M&A market to the seller’s health can complicate the sale of a business. When an entrepreneur is in startup mode, it can be hard for some of them to envision the endgame. However, without a plan in place, it can be hard for an owner to find their way to the finish line. Without an exit plan to inform their future goals, they work in their business instead of working on it, which can lead them to tread water indefinitely. Years down the road, they are no closer to where they think they need to be to begin planning their exit. By taking a few hours to step back from day-to-day operations, owners will free up the bandwidth they’ll need to define their long-term goals and the steps they need to take in order to increase the value of their business. Otherwise, chances are good they will remain mired in the stagnation that occurs when an owner becomes an employee within their own business. Some businesspeople assume they will have to stick around for an extended period after a sale to ensure the transition period is a seamless one. As such, they conclude that exit planning makes no sense, as there is no way they would be able to leave shortly after selling their business. However, if they commit to creating a management team beforehand which is capable of running a profitable business, they may be able to make their exit within a couple months post sale. Owners who fail to do this resign themselves to living out the scenario they think is inevitable: a long and painful transition that can last years.